Vision Salmon rods have a reputation which goes before them and we sell more Vision Salmon rods than any other. Vision trout rods are not so well known, which is a shame, they should be. The build quality is there and the casting capabilities are perfect. Definitely not to be overlooked! 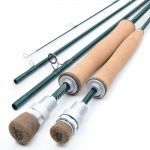 Vision Onki Fly Fishing Rod - Our Most Popular Trout Fly Rod!